The clouding of the eye's naturally clear lens is called a cataract. A cloudy lens interferes with light passing into the eye. Having a cataract can be compared to looking at the world through a foggy window. Cataracts are now removed by a revolutionary surgical technology called phacoemulsification. A small hole is cut into the eye, and another into the capsule that surrounds the cataract. The cataract is then cut up and vacuumed out of the eye in tiny pieces using phacoemulsification technology. The artificial lens that must replace the cataract (in order to restore vision after surgery) is then placed inside the capsule. All of this is done as day surgery at the hospital. Please note: Cataract surgery is NOT done by laser. What is an intraocular (artificial) lens? An intraocular lens is an artificial lens implant, which is made of an inert substance such as silicone or acrylic. This lens is placed permanently inside the eye at the time of cataract surgery right after the cataract is removed. An artificial lens is required to see properly after the surgery. Without an artificial lens implant, you will need very thick glasses to see. All patients with provincial health insurance are now covered for single distance foldable intraocular lenses. These lenses are soft and are folded into a small thin shape, and then inserted into the eye through a very small hole. Once inside the eye, the intraocular lens unfolds and is positioned neatly into the capsular bag to replace the cataract. The cloudy window is now all clear. Are there stitches with cataract surgery? 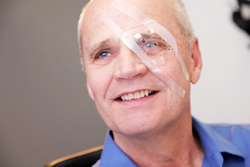 Cataract surgery is done through a very small incision (hole) in the eye. Most of the time, this incision is self-sealing and does not require any stitches. However, if it is leaky, it will be sealed closed with either a dissolvable or a semi-permanent stitch that may or may not need to be removed after surgery. Occasionally, people feel a bit of foreign body sensation or eye irritation when this stitch becomes loose several weeks later, in the case of a dissolvable stitch, or months or even years later, in the case of a semi-permanent stitch. If this happens, contact your surgeon to check your eye and pull out the stitch if necessary. This is a simple, painless office procedure that can be done when you visit your surgeon. The single distance foldable lens (now covered by Manitoba Health) will correct your vision for one distance only. Therefore, most people who get these lenses can see well in the distance, but will still need glasses to read after surgery (usually cheap over the counter glasses are good enough). Are there intraocular lenses that correct for near and intermediate distances and astigmatism? These lenses are NOT covered by Manitoba Health and are an extra cost to you. You may or may not be a candidate for these lenses. If you are interested in any of these options, please contact our office. Please note that outcomes with these lenses may vary depending on the accuracy of pre-operative eye measurements and varying patient factors. Although, the goal of premium lenses is to essentially acquire the best post-surgery vision without dependence on glasses, it is not possible to guarantee perfect 20/20 vision. MULTIFOCAL LENSES: These lenses correct for distance, mid-distance and near vision. These lenses are not recommended for patients who have vision loss from glaucoma, macular degeneration or other eye problems (besides cataract). In dim lighting conditions, you may still require reading glasses, therefore they are not suitable for people who require reading vision in dim light (for example, waiters, night shift workers). They may cause a slight halo effect around lights at night. TORIC LENSES: Astigmatism is an irregular curvature of the cornea (front “window” of the eye). It is as if the eye is shaped like a football instead of like a soccer ball. It causes blurred vision that is not corrected with a regular foldable artificial lens. You will still have to use glasses to correct astigmatism after surgery if you get a regular foldable lens. However, if you are a candidate for a TORIC lens, this will correct your astigmatism and distance vision. Although, you will still need glasses for reading, your distance vision will be a lot clearer without glasses. These lenses are not usually recommended for glaucoma patients getting combined glaucoma and cataract surgery, or glaucoma patients who have a condition called Pseudoexfoliation (which may cause looseness of the capsular bag holding the lens in place, though some exceptions may apply). MULTIFOCAL TORIC LENSES: These lenses correct for near, intermediate and distance vision, and also correct for astigmatism. The aim is to liberate a person from the need to wear glasses (though reading glasses may still be required to read in dim light). As with multifocal lenses (see above), they are not suitable for people who require reading vision in dim light (for example, waiters, night shift workers). They can cause a bit of halo effect around lights at night. They are not recommended for patients who are having combined cataract and glaucoma surgery or who have Pseudoexfoliation Glaucoma (some exceptions apply) because the astigmatism measurement can vary after these types of surgeries. They are also not suitable for anyone with pre-existing eye disease that has already compromised their vision, such as macular degeneration, since it is possible that the vision in these situations will become more degraded from slight glare and halo effect. What type of anaesthesia will I be getting? Will I feel anything? Cataract surgery is done under topical anaesthetic (anaesthetic gel and drops) with intravenous (IV) sedation. This means that you are awake during surgery, but will not feel anything during the surgery. At the beginning of the surgery, you will feel your surgeon preparing the area by putting a drape over your face and placing a clip under your lids to hold your eye open. You will be able to see light and colours during the surgery. Cataract surgery will take about 15 to 30 minutes (depending on the maturity of the cataract and/or other challenging factors). If I am taking blood thinners, will I have to stop them? If you are having cataract surgery alone, there is no need to stop your blood thinners. If you are having cataract surgery combined with a glaucoma surgery, you WILL need to stop your blood thinners before surgery in consultation with your family doctor or specialist (1 week for aspirin or Plavix (clopidogrel); 3 days for Coumadin (warfarin). You will be able to restart them about 3 days after surgery, unless otherwise stated. Are there any medications that are injected into my eye at the time of eye surgery? Why does Flomax (tamsulosin) have a potential influence on cataract surgery? Routinely, non-preserved lidocaine anaesthetic is injected into the eye to ensure that the surgery is comfortable. Flomax ® (tamsulosin), used for prostate hypertrophy, can cause IFIS or “intraoperative floppy iris syndrome”. This causes some difficulty in removing the cataract and dilating the pupil. Usually, non-preserved 2.5% phenylephrine (an adrenalin-like drug) is used to help dilate the pupil and keep the iris from billowing into the instruments that are used to take out the cataract. Sometimes, tiny hooks or devices are used to stretch the pupil to make sure it is steady and out of the way. Overall, problems with Flomax ® are easily overcome with these manoeuvres. Stopping Flomax ® before surgery will not prevent this problem from occurring, therefore there is no need to stop Flomax ®. Non-preserved phenylephrine 2.5% may also be used to dilate the pupil more fully by injecting it directly into the eye. If there is any reason to suspect high risk for infection, either with prolonged surgery or other patient risk factors, moxifloxacin drops (Vigamox ®) may be injected directly into the eye. This has been shown to be a safe and effective way to prevent infection in high risk cases. If you have had a previous surgery for glaucoma called trabeculectomy, you will likely have a superficial or “subconjunctival” injection of Avastin ® (bevacizumab 2.5mg) at the end of the surgery. This will sting a bit. This prevents closure of the trabeculectomy site, which helps drain fluid out of the eye to lower eye pressure in glaucoma patients. Often, after cataract surgery, particles get flushed through this site and promote scarring and failure of the filter. Avastin ® helps prevent this by inhibiting growth of new blood vessels that support newly growing tissue, like scar tissue. This medication is used for chemotherapy in colorectal cancer and also in other eye conditions like proliferative diabetic retinopathy and wet macular degeneration. It rarely can cause closure of blood vessels and lack of oxygen flow causing tiny “strokes” to the area it is used. This is a very rare, potential complication. If this happened, your vision would be much blurrier than expected after cataract surgery. You should call your surgeon’s office for a follow-up check as soon as possible. Complications are rare during and after cataract surgery, but can occur. The most common complication during surgery is rupture of the capsule that holds the cataract, possibly causing spillage of cataract material to the back of the eye. If this happens, your surgery may be prolonged, or you may require another surgery afterwards. Also, you may need an anteriorly placed lens, which will require a larger incision, which must be stitched up. If promptly and effectively managed, you should still have a good visual outcome with this complication, although it will take longer to recover. Capsule rupture can happen more commonly with an eye condition called "pseudoexfoliation" . In this condition, which is often associated with glaucoma, small particles can collect on the fibres, which hold the capsule in place, and cause the capsule and cataract to be wobbly and break easily during surgery. You will be told if you have this condition. Surgery can still be done in this case, but it often takes longer due to special precautions that need to be taken to prevent problems. Sometimes, if the capsule is too floppy and loose, a capsular tension ring is inserted into the capsular bag as well. This helps stent the capsule and provides more support for the capsule and lens. The capsular tension ring and artificial lens are permanently implanted. You will receive a card with information on these implants at the end of the surgery. Pseudoexfoliation can also prevent proper dilation of the pupil for cataract surgery. If the pupil is not dilated widely enough for various reasons, it may become necessary to use “iris hooks” or a similar iris- stretching device. After cataract surgery, the pupil may still look slightly stretched and irregular for some time, however this will not affect the vision. Sometimes after cataract surgery, especially if a patient has glaucoma of any type, the eye pressures can become very high and may require extra medication by mouth or by intravenous to control. Occasionally, a second surgery is required to control the eye pressure. Other possible complications which could cause problems with your vision or even loss of vision include chronic swelling of the cornea, prolonged inflammation, elevated eye pressure, infection, retinal detachment and hemorrhage (bleeding). These could occur during or days, weeks, months or years after the surgery. Thankfully, these complications are rare. We try our best to identify these problems and treat them as quickly as possible. It is important for anyone who has cataract surgery to get checked promptly (same day) if he/she is experiencing severe pain or headache, worsening redness, decreasing vision, sudden onset of flashing lights (lasting seconds) or new onset floaters. If the problem occurs on an evening or weekend, your surgeon may not be available. For post-surgical emergencies after- hours, call the Misericordia Hospital switchboard at 204-774-6581 and ask for the on call Ophthalmologist. Anaesthetic complications are extremely rare but can happen even with the small amount of intravenous medications and local anaesthetics that are used. Most of the time, if a patient is comfortable, no drugs are used. However, if a patient is nervous and needs something to stay relaxed, a small amount of sedatives and painkillers are used in the intravenous. In some patients, use of local anaesthetics in and around the eye can cause decreased vision, bleeding and nerve changes. These effects are usually temporary and resolve with time. Rarely, there can be permanent damage. In rare patients with multiple medical problems, these drugs can potentially cause cardiac or neurological problems, resulting in serious illness or even death. We are certainly vigilant of any concerns with the use of medications in our patients and are prepared to deal with these kinds of emergencies. However, we cannot always predict when a serious drug reaction will occur. Fortunately, these complications are extremely rare with local procedures. After the surgery, you will be seen in the office (or Misericordia Health Centre on weekends) later that day or the next day, and 1 week later. You should see your Optometrist 4 to 6 weeks after (the second eye) surgery to update your glasses. You will need to use 3 different types of eye drops for 4 weeks. If you are taking eye drops for glaucoma, you will need to continue these in addition to the extra post-operative drops, unless otherwise instructed. If you are having glaucoma surgery combined with your cataract surgery, the glaucoma eye drops will be stopped after the surgery in your operated eye only. Full instructions will be given at the time of surgery. You will also receive a card with information about the implanted lens to keep for your records. Your eye will be covered with a shield when you leave the hospital. You can take the shield off when you get home, and then tape it over your eye at night for 1 week to protect your eye while sleeping. We recommend 3M Transpore ® tape available at any drugstore to tape on the shield (hypoallergenic and latex free). Will I be able to see clearly immediately after surgery? Since we do not use a freezing needle injection around your eye, you will be able to see right after surgery. However, because your eye has been exposed to the bright shining microscope light, phacoemulsification energy and lots of fluid for the duration of the surgery, there will likely be some temporary swelling and inflammation. Expect your immediate post-operative vision to be blurry. Over the course of the next few days, your vision will improve as the swelling and inflammation clears up. It is not usual for your vision to get worse. If you have worsening vision or pain, call your surgeon’s office or the Misericordia Health Centre at 204-774-6581. Will I be more light-sensitive after cataract surgery? After cataract surgery, many people notice that they are more sensitive to bright lights. This is common, since the clear implanted lens allows more light into your eye than the cloudy cataract that was removed. Overtime, you will get used to the change in brightness after cataract surgery. The implantable lenses have built-in UV protection. You should routinely wear sunglasses in bright light to protect your eyes and keep them comfortable. If you do not have anyone who can stay at home with you, we will arrange for you to stay overnight in the hospital. It is important to have someone stay with you the night of your surgery, because any sedatives used may make you may feel drowsy after the surgery. In this case, your surgeon will see you before you leave the hospital. Please let us know if you require help with your drops and we can arrange this prior to your surgery. If you already have homecare, please let us know and we will forward all the necessary updated orders to your homecare nurse prior to the surgery. With uncomplicated surgery, vision returns quickly and one can resume normal activities within a short period of time (usually a few days to a week). If you need short-term disability forms filled out, please present these to us PRIOR to your surgery, as the surgeon cannot fill these out on the day of surgery. What restrictions do I have after cataract surgery? After uncomplicated cataract surgery, healing is usually reasonably fast. It is important to avoid getting direct water into your newly operated eye for 2-3 days. It is also important to avoid very strenuous activities and exercise for the first week. Wear the plastic shield provided over your eye at night for the first week. Avoid any appointments to the dentist the first 2 weeks after surgery (as dirty matter can spray into your eye and cause an infection). Do not plan to fly right after cataract surgery. It is best to plan your trips at least 3-4 weeks after cataract surgery in case of unforeseen circumstances. If you are having glaucoma surgery combined with cataract surgery, please see the Glaucoma Surgery section on further restrictions that apply.